At Avalon Bowery Place II, 22 East 1st Street, we were charged with designing the interior common spaces for this ninety unit rental apartment building by the developer AvalonBay Communities. We collaborated with SLCE Architects (Architect-of-Record) and Arquitectonica (Building envelope design). Chrystie Place is distinguished by its location in Manhattan’s Lower East Side which is characterized by lively and fashionable streetlife. 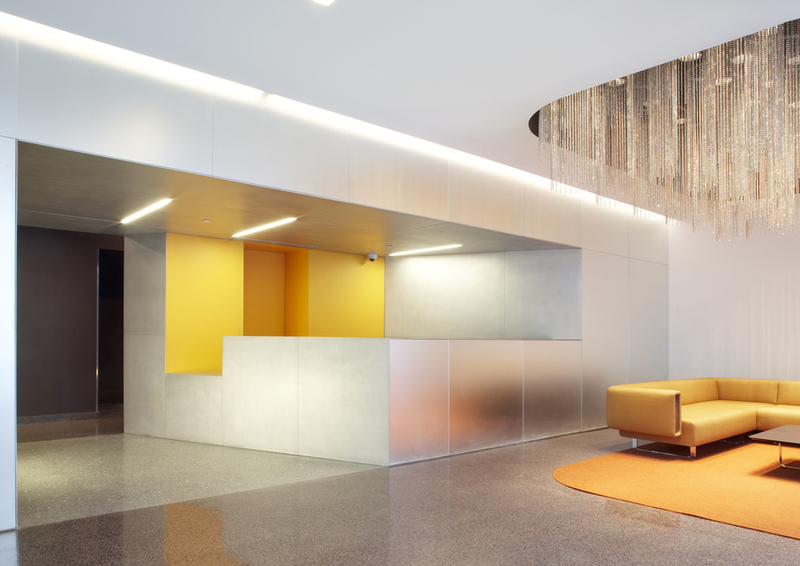 We sought to maximize this by suggestively bringing the streetscape into the building and pushing the significant entry threshold to the back of the lobby through the use of color and finishes. The recycled glass terrazzo floor in the lobby provides an element that is a transition on a micro scale (as well as being an environmentally friendly product) because it blends a cement suggestive of the sidewalk with glass fragments that pick up the glass elements in the lobby. Grouping the concierge, mail and package amenities into a monolithic bar which is clad in aluminum and satin-etched glass creates a massive wall. This becomes the effective boundary between the public street zone and the residential area. 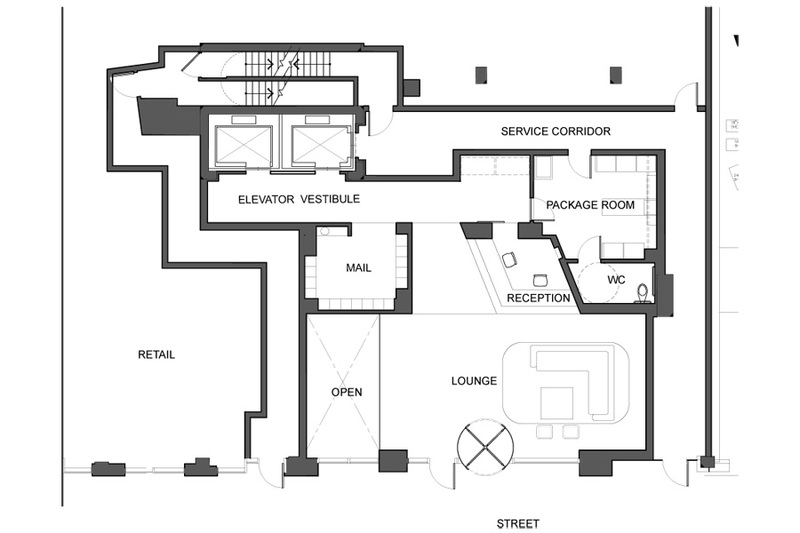 The floor opening into the cellar-level lounge opens that area to the street with a double height space at the facade, making the interior life of the building explicit to the street level. Utilizing the satin etched clad double height wall we reflect the street life animating the wall which links the lobby and the basement lounge to the streetlife. At the same time the wall also allows passerbys to see the interior activity in the basement reflected at street level. This dual effect works with the idea of seeing and being seen which is so much a part of the neighborhood life and attraction. Surfaces are covered in materials that manipulate optical effects and promote ambiguous readings of the planes. By juxtaposing aluminum panels with translucent/back mirrored glass and mirrored glass we invite the viewer to investigate the character of the space.